President Joanne MacLean delivers her installation speech. 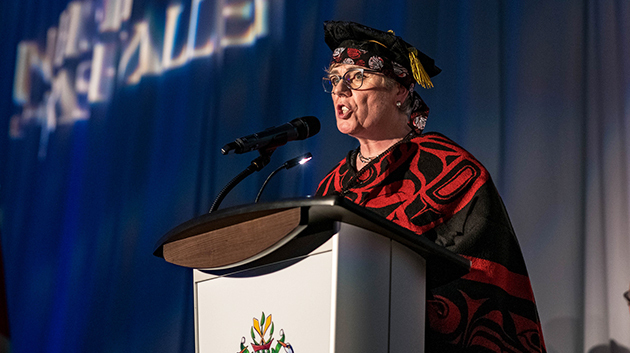 The University of the Fraser Valley marked the beginning of Dr. Joanne MacLean’s term as president and vice chancellor on May 11 with an installation ceremony on its Abbotsford campus. Dr. MacLean was formally installed by Lieutenant Governor Janet Austin. The ceremony was attended by representatives from local, provincial, and federal levels of government; from other B.C. universities; from the local Stó:lō community, and by faculty, staff, administrators and students of UFV. With more than 30 years of experience as a professor and university administrator, MacLean held appointments at the University of Windsor and Brock University in Southern Ontario before coming to UFV as Dean of Health Sciences in 2012. She earned her undergraduate and master’s degrees in physical education at the University of New Brunswick. She holds a PhD from Ohio State University, where she studied human resource management in sport and recreation, and administration in higher education. 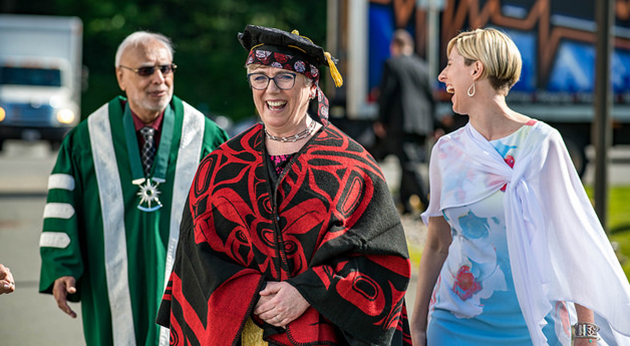 President Joanne MacLean enjoys a lighthearted moment post-ceremony with Chancellor Andy Sidhu (left) and her partner Maureen Murphy (right). MacLean has held positions as professor, department chair, athletic director, and dean. As an accomplished university basketball coach, she was selected Ontario Coach of the Year three times while at the University of Windsor. She participated as a coach and administrator at three World University Games, and was Canada’s Chef de Mission at the same event in 2003 in South Korea. In her address to the audience at the installation, MacLean said she will draw on her decades of experience as a coach, teacher, researcher, and administrator in her new role. She also committed to supporting the efforts of students, faculty, and staff. She noted that two weeks into the job, she still has a lot to learn and she will dedicate herself to the mission of guiding UFV in its development. 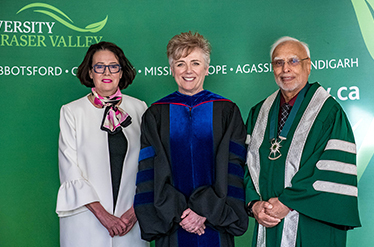 Joanne MacLean pre-installation ceremony with Lieutenant Governor Janet Austin and UFV Chancellor Andy Sidhu. UFV Board of Governors Chair John Pankratz welcomed MacLean to her new role at the ceremony.